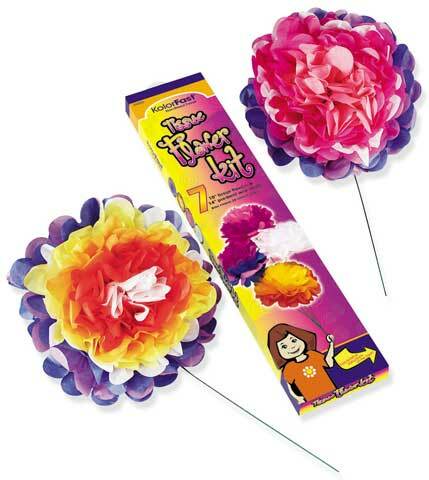 Create beautiful, brightly colored 10" tissue flowers. Simply accordion fold tissue, attach stem and primp tissue to create a ready-made bouquet, centerpiece or party decoration. These kits contain instructions, wire stems and pre-cut KolorFast Tissue with scalloped edges. The Tissue Flower Kit includes the materials to make seven flowers and the Class Pack Tissue Flower Kit includes the materials to make 84 flowers.